A wealth of displays has emerged in the AV market in the last years empowering organizations to deliver captivating messages in any form imaginable. DSplay can handle any mix of displays such as LCDs, video walls, LED panels, stretched displays, kiosks and more, regardless of geographic distribution and network infrastructure. Are you looking to streamline your content publishing process? Support multiple zones and channels? Restrict access to content functions? Advertise third parties and change content projections? DSplay can deliver all that and many more exciting features while setting you free from specific hardware manufactures and letting you combine whatever equipment is appropriate for your digital signane installation. DSplay supports Windows, Linux, Android and even LG WebOS, in case you want to eliminate an external media player entirely! We have taken a standards based approach in developing our content management system and came up with a solution of remarkable openness! 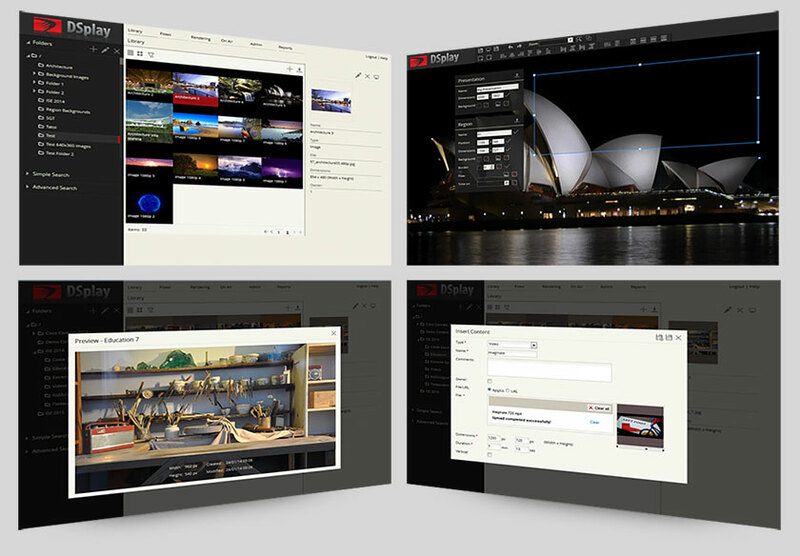 DSplay extends the functionality of digital signage CMS beyond mere publishing of video clips, images, or common file types in fixed playlists. As anyone who has gone through their first publishing cycle knows, renewal of content displayed can become a demanding task requiring valuable resources. Automation of content renewal is a key factor in achieving a solid ROI in digital signage installations and DSplay has been engineered to retrieve dynamic content conveniently and reliably. Smart playlists can be configured based on various criteria such as date/time. External content sources in various formats, including RSS, social media, database feeds and back end systems can be utilized to provide a constant flow of updated content. Audience driven events or sensor input, such as beacons, can trigger interrupts to normal content flow and render custom content depending on the input received. Content items in independent zones can be automatically synchronized to create a coordinated flow on discrete display areas. Your ERP, CRM, BI platform, Web CMS or HR system can all be sources of meaningful information that you can now share with your partners or customers! Reliability and performance are key differentiators of a native digital signage player vs browser based ones! To learn more about DSplay's support for interactivity click here. To learn more about DSplay's capabilities to connect to live data sources click here. A clean and sharp UI rendering ease-of-use and efficiency. Whether your network of displays fits in a small reception hall and is managed by a single person or spans across several countries and has numerous concurrent users and displays, it is important to know that your digital signage solution is properly sized and up to the task. DSplay is an easy fit from the entry level to the most demanding corporate enviroments. With one of the most affordable licensing schemes in the market, it comes packed with functionality and a modest price tag. To support more displays and media players, you only need to deploy more licenses. You just pay as you grow. DSplay has a modular structure and a very light footprint in computing resources. This enables scaling to thousands of displays without costly investments. DSplay can be deployed on premises for customers managing their own infrastructure or as a cloud service accessed from anywhere there is a network connection. With a solid decade of research and development effort on behalf of our team, DSplay has been designed and tested to meet the needs not just of IT experts but, primarily, of marketing professionals with precious little time in their hands. Sure the software is multilingual and it is entirely web based, so all you need is a browser, there is no need to install any application on your device. It's also designed with a focus on ergonomics, so all tasks are accomplished in as few clicks as possible. Do you need to tag content according to its owner and retrieve statistics? Obtain approval for content flows and schedules, online or offline? DSplay can even help marketers publish their own touchscreen applications through an intuitive, step-by-step wizard. That's right, you can develop your own interactive applications without any programming at all! If you would like us to give you a guided tour while explaining the platform's perks for your particular digital signage installation click here. Get a more detailed presentantion of DSplay functions and features here.